JOHANNESBURG — A champion runner at the center of a gender controversy is set to take university final exams, her father said Friday, contradicting earlier reports she was too traumatized to study. "She's all right, I was with her this morning," Jacob Semenya said, adding she was too busy studying to give an interview and would take her exams as scheduled. 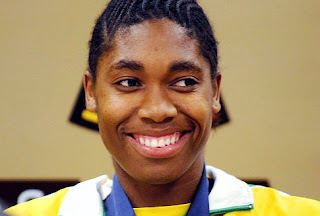 Caster Semenya, 18, is a first year sports science student at the University of Pretoria. South African media reports quoted Caster Semenya's coach, Michael Seme, earlier this week saying he suspected the trauma of the controversy led her to request a test delay. Jacob Semenya denied that: "They can say what ever they want to say, but the truth will always be the truth." Caster Semenya won the 800 meters at the Berlin world championships in August. Before the final, the International Association of Athletics Federations announced it had ordered gender tests and it is still waiting for the experts' verdict on whether she can continue competing as a woman. Winnie Madikizela-Mandela, a prominent African National Congress member who is on a committee formed by the governing party to support Caster Semenya, also told reporters Friday the reports were untrue. "She says she is very happy with herself, she has overcome this particular hurdle she was going through," Madikizela-Mandela said. "Now she is fit to write her exams." The IAAF has been criticized in South Africa and abroad for publicly acknowledging tests had been ordered. IAAF rules call for such procedures to be confidential. The ANC's Semenya committee called a news conference Friday to call on the IAAF to void any test results, saying that track's international governing body did not follow its own procedures. ANC spokesman Jackson Mthembu also called on the IAAF to apologize, and criticized South African track officials for their role.